MKs from Left and Right blast 'stupid, unhelpful' decision to mark products made in 'Territories'. 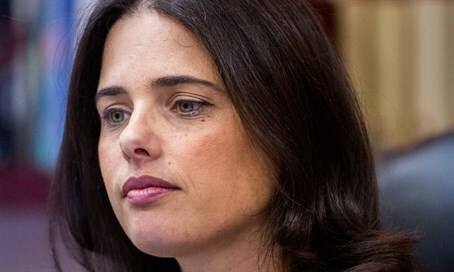 Justice Minister Ayelet Shaked (Jewish Home) said Wednesday that the move is "an anti-Israeli and anti-Jewish decision." "European hypocrisy and hatred toward Israel have exceeded all possible limits," she stated. "It's interesting that in Western Sahara and Cyprus, they were never told to mark products," she noted, in a comparison to two other disputed territories that have been considered "occupied." The minister said that she was weighing the taking of legal steps against the EU's decision. Israel's Foreign Ministry summoned the EU ambassador Wednesday for a dressing-down following the announcement about the product marking. Israel said that it denounces the EU's decision. "We regret that the EU decides, out of political motives, chose to take a discriminatory and unusual step that is taken from the world of boycotts, and did so of all days at a time when Israel is dealing with a terror wave against its citizens." The Foreign Ministry accused the EU of implementing a double standard regarding Israel, while ignoring 200 conflicts throughout the world, including some that are taking place literally at its doorstep. The claim that the marking is a "technical step" is "a cynical and baseless argument," the ministry added. Marking products will not advance a peace process between Israel and the Palestinians, it argued, but have the opposite effect and strengthen the PA's rejection of direct negotiations with Israel, which the EU has said it would appeal." MK Itzik Shmuley (Zionist Union) said that the EU decision was "stupid, hurtful and unhelpful" and that it "places a large stain on Europe's forehead." "The residents of Hamburg or Copenhagen do not really understand where the Green Line begins or ends, and in practice, the decision will lead to a boycott of all Israeli products. It is too bad," he added, "that Europe decided today, shamefully, to strengthen those who lead the boycott campaign against Israel, whose aim is to wipe Israel off the map and not to advance peace." MK Yair Lapid (Yesh Atid) reacted to the news by saying: "While Jews are being stabbed in the streets, the European Union surrendered to the BDS movement and adopted a decision to mark products that discriminates against Israel and encourages terrorism." MK Oren Hazan (Likud) called the decision "Modern day Nazi propaganda. Seventy years have gone by, and they have learned nothing… Today it is products [that are being marked, ed.] – tomorrow it will be us"
Energy Minister Yuval Steinitz said on Tuesday that the EU's step was "disguised anti-Semitism". "What you see is really that some people, and here unfortunately some institutions in the European Union, are taking steps against Israel that are unparalleled in similar situations," Steinitz told journalists. "So we cannot conceive it but as some disguised anti-Semitism."